Deadly deeds dance in this winner’s mind! Meet Virginia Winters, author of the Dangerous Journeys series and Summer 2013 contest runner up. Please take a moment to enjoy her tale of twisted love, Sunrise, and then come back to learn more about this delightful writer. 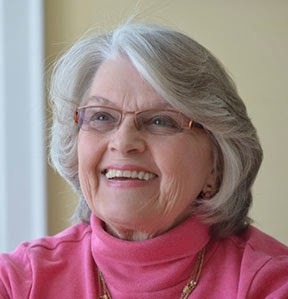 Virginia Winters is a writer living in Lindsay, Ontario. Now retired, she practiced Pediatrics for thirty-four years. She lives with her husband, retired internist, George, their standard poodle, Charlie and cat, Fred. In 1998 she began writing her first novel, Murderous Roots, which was published in 2008 by Cambridge Books of Cambridge, Maryland. She is very grateful to Arline Chase for taking a chance on her. Along the way, she wrote some short stories that found success first in local writing contests and later in other venues, such as Sentinel Literary Quarterly in London, England. Her second novel, The Facepainter Murders, was published in 2010 and her third, No Motive for Murder, in 2012, both by Cambridge Books. Together, they comprise her Dangerous Journeys series with genealogist (and retired pediatrician) Anne McPhail. Other Anne adventures are posted on her Wattpad site. Virginia loves to travel and the locales, such as Bermuda, show up as settings in her novels. Other interests are genealogy, gardening, photography and learning Italian (for those vacations). Currently, she has one just finished in first draft and has just begun a fourth novel in her Dangerous Journeys series, called, at the moment The Spanish Connection. She is excited to have placed in the top 10 in the WOW! Flash Fiction Contest, and grateful for the opportunity to talk about her work. WOW: Hi Virginia, welcome to The Muffin! Well, you got me! While visiting your websites I got side tracked reading Murderous Roots. I’m ready for the next book in the series now! Virginia: Thanks so much. I hope you enjoy book 2, The Facepainter Murders. I'm working on book 4, which takes Anne to Spain. WOW: Three published books and one in the works…Many people think that contests are only for novices. Tell us why you enter contests when you are already a published novelist? Virginia: In most instances, contests aren't for novices at all, unless a particular contest is for unpublished authors. The ones I enter, such as yours, have a high standard and I enjoy the competition. Sometimes a contest will give feedback, useful in the revision process for a story that hasn't won or placed. I was first published when I won a contest sponsored by a small press in North Bay, Ontario. I can't imagine being more thrilled than I was the day the email came. It encouraged me to write on as does every contest I win. I have entered your contest in the past but this is the first time I have placed in the top ten. I was excited to place, not for the monetary prize but for the opportunity to be interviewed and to have my work appear on your site. Thank you very much for designing the contest, and your site, to offer so much value to women authors. WOW: You’re welcome! We love helping other writers reach their goals; thank you for allowing us to be part of your journey. Writing Sunrise must have been quite a bit different than working on your novels. What challenges you, or what do you enjoy, about flash fiction? Virginia: The challenge in flash fiction is create a world in a few precise words and develop the story and the characters within: a polar opposite to the novel. I enjoy the clarity of a flash fiction piece both reading one and writing one. I write a flash piece in a burst of creativity, often finishing the first draft in a few minutes. Then comes the revision, searching for the correct word or image, but the bones exist from the first few moments. All much freer than the novel-writing process. WOW: We often talk about pacing and keeping our reader’s attention; what advice can you offer for keeping tension alive in a murder mystery? Virginia: Always leave a scene or a chapter with a question for the reader. What is going to happen to the protagonist? If I'm using a third person point-of-view, I shift to another character in a different location, leaving the reader to worry for a short while about the outcome. Never be kind to the reader or the character. Both have to be uncomfortable at the end of a chapter, encouraging the reader to turn the page. Recently a reader called me to say the latest Dangerous Journey novel, No Motive for Murder, had kept her up most of the night. That's what I want to accomplish. For many of us, finishing that first manuscript is an exercise in personal growth; what did you learn about yourself while writing your first novel? Virginia: One day I picked up a novel by a writer I had enjoyed, only to be so disappointed I thought I could do just as well. But I couldn't of course. I wrote the first book in long-hand, in one of those cloth-covered journals people gave young women in the eighties, with no thought to proper formatting of the dialogue or knowledge of the overall structure of a novel. I gave the manuscript to a friend who taught at a local community college. He said the book was unreadable. So the first lesson was humility. It is no easy thing to write a book. The second lesson was persistence. I rewrote and revised and then a journalist of my acquaintance, after reading it, told me I needed to learn to compose on the computer. He also had some kind words about the book itself. The third lesson was that rejection hurts and the committed writer should use it to make the writing better. It came down to this: I was a writer, but I had more to learn. WOW: And you kept at it! Ten years plugging away on your first novel; how did you keep your interest in that first story alive? Virginia: I'm stubborn and goal-oriented and don't like to fail. It was a slow process. I didn't know how to write although I had a story I wanted to tell. Studying the craft and using what I learned to revise the book helped keep my interest high. I also wrote some short stories about Anne that I posted on Wattpad (http://www.wattpad.com/home). Giving Anne a life beyond the book helped keep my interest high. WOW: I’m glad you stayed with it; I’ve enjoyed reading your stories. Thank you for visiting with us today and for sharing your writerly insights. We hope to see more flash fiction entries from you in our future contests. Congratulations on the top ten win. I liked how you said "Never be kind to the reader or the character." Things can't be all nice for the character or the story wouldn't be interesting!